Many of the songs from Sam Larner's repertoire are sure to get an airing during the SamFest 2015 weekend but Sam will be remembered in other ways too. Sam and his wife Dorcas had no children of their own but Sam had eight brothers and sisters and we expect that some of their descendants will be joining us. Peggy Seeger, who played such a vital part in introducing Sam to the wider world, will be with us to share her memories of Sam. 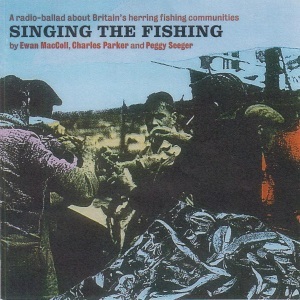 Peggy will be in conversation with Peter Cox, author of the book Set Into Song about the Ewan MacColl / Peggy Seeger / Charles Parker Radio Ballads, which included Singing the Fishing, featuring Sam. 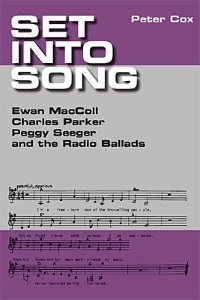 Peggy Seeger discusses Sam Larner and The Radio Ballads. Norfolk folkie Chris Holderness did not know Sam personally, but carried out comprehensive research on Sam for the booklet which he compiled for the release earlier this year of the 2CD Sam set Cruising Round Yarmouth (Musical Traditions). Chris will give a talk on Sam and his place in the English folksong tradition. 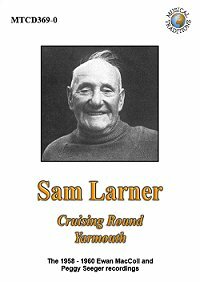 We hope to have copies of Peter's book and of Musical Tradition releases, including Cruising Round Yarmouth, on sale during the SamFest weekend. The two talks will be open to SamFest all-day ticket holders, and a limited number of tickets for the individual events may be available at the door. A talk on Sam Larner and his place in the English folk tradition. Archive films featuring Sam and fellow Norfolk traditional singers Harry Cox of Barton Broad / Catfield and Walter Pardon of Knapton will be shown on both Saturday 19 September and Sunday 20 September at a Winterton venue yet to be confirmed. The two film shows will be open to SamFest all-day ticket holders, and a limited number of tickets for the individual events may be available at the door. A film show featuring archive footage of Sam Larner, Harry Cox and Walter Pardon. 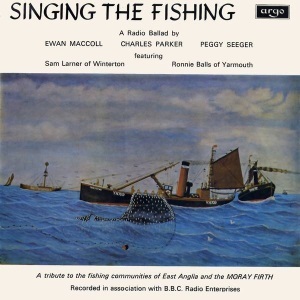 Life in Winterton during Sam Larner's time was closely linked to the herring fishing industry and the "silver darlings" will play their part in the SamFest celebrations. The Longshore Herring Festival was established in the neighbouring village of Hemsby several years ago and has grown into a popular annual attraction. 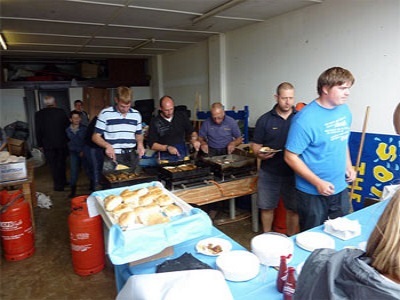 This year members of the independent Hemsby Inshore Rescue Service will be visiting Winterton to barbecue and serve up herrings for festival fish lovers. The Winterton No 1 Lifeboat from 1896-1925 was the Edward Birkbeck which was found abandoned in a sorry state in Conwy Harbour, North Wales, a few years ago. The vessel was rescued and returned home in 2012 by the Winterton-on-Sea Lifeboat Restoration Group - a team of willing volunteers. Since then the volunteers have spent many hours on the restoration project - and are now hoping to build a new heritage centre home for the Edward Birkbeck, near to where the last Winterton lifeboat house stood. 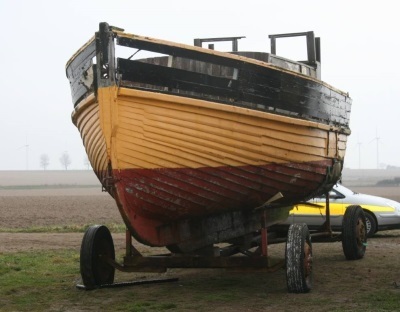 Fundraising for the restoration work on the Edward Birkbeck continues and the lifeboat itself will be on display in Dune Court, Winterton, near to Sam Larner's old cottage home in Bulmer Lane, during the SamFest weekend. 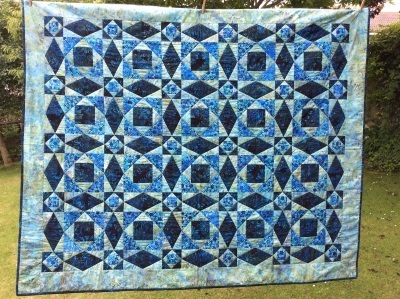 The stunning quilt, Storm at Sea, made by Julie Paveley of the Winterton Quilters, is being raffled at SamFest in aid of the Edward Birkbeck restoration project. 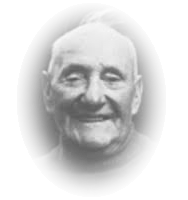 Sam Larner probably turned his hand to mending nets and darning his sea socks hundreds of times during his long years as a herring fisherman - but he is not known for his skills at quilting. These days, 50 years after his death, Winterton has a very active - and talented - quilters' group. To commemorate Sam's life, one of the group members, Julie Paveley, has made a stunning quilt, named Storm at Sea, especially for SamFest 2015 - that can be won by any festival-goer. The quilt will be on display at various musical events during the weekend and raffled at the end of the festival in aid of the Edward Birkbeck lifeboat restoration fund .